❤ [MAKES DISHWASHING EASIER AND SAFER]: Protect your wife / husband from Cleaning harm. 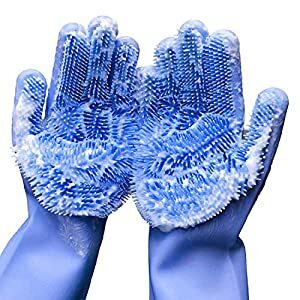 [Antibacterial dish scrubbers]. The scrubbers are made of food grade silicone, which is naturally antibacterial since it is not porous like regular sponges and cloths are. With these silicone dish scrubbers, no more stinky bacteria-laden sponges! PLEASE NOTE: IT DOES NOT ABSORB WATER! 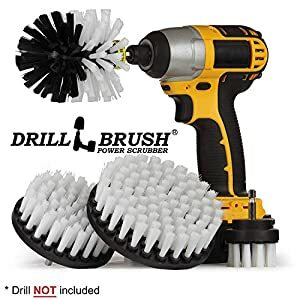 Cleaning brush total length: 12″ (305mm) ; Bristle head: 2.8″ (70mm) long x 1/2″ (12mm) diameter. Handle is made of 304 Food-Grade 18/8 stainless steel wire wound, BPA free, no rust, flexible, easily deformed. 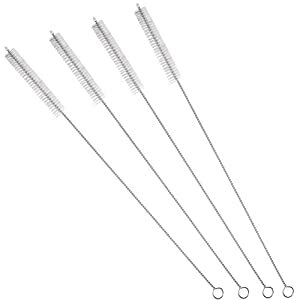 Durable but soft nylon bristles in a spiral, a good contact with the straw wall, straw scrub.